Take a look at the recent FBI statistics on crime. The escalated rate of crimes particularly involving women as victims should reinforce your need to take a proactive stance in self defense techniques. That is why you should not leave home without the lipstick pepper spray stashed in your hand bag. With the lipstick pepper spray in your bag, you will feel more in control in unexpected situations and be able to project an aura of confidence that may by itself prevent a possible attack. The lipstick pepper spray is handy to have around not only to protect you from a human attack but from canine or any other animal attack. The pepper spray holds 20 half second bursts that can be sprayed up to a 10 feet distance. The container looks no different than the average lipstick tube but only you will know that it is sheathing a potent self protection spray system. The Lipstick pepper spray is an exclusive woman oriented self defense device optimizing your need for a subtle and convenient means of self protection. The moment you come in to contact with a person who makes you uncomfortable or feel threatened, simply reach in your pocket or handbag and take out the lipstick. Then remove the cap and keep it ready for instant use. The element of surprise will provide you with ample getaway time. The spray does not cause any permanent damage or health risk. A burst from the spray to the face will result in temporary blindness, coughing, nausea, choking and in effect will bring the attacker on to his knees. 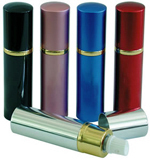 The lipstick tube can be bought in five tasteful colors including silver, blue, pink, black or red. It is an ideal choice as gift for a girl friend, sister, mother, daughter, wife or any other women you want to help protect.